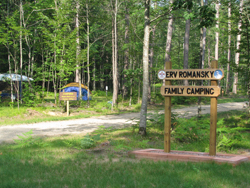 To support those that choose not to stay with the unit at summer camp we have an area with 14 campsites. 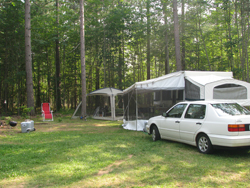 We can accommodate tents, pop-ups as well as full size trailers or motor homes. Each site has a firepit, water and electricity. Reservations can be made up to a year in advance by contacting the Wausau Homes Scout Center at 715-355-1450 or online. A deposit equal to half of the site fee will be due with your reservation. Final payment can be made in advance or upon arrival. Sites are $20 per night. All sites include electric and water. Book Online - Use this link to reserve your campsite online. All campers should register at the Tesomas Program Center when they arrive at the campground. If the office is not open please call our main number (715-365-3111) to verify your site assignment. Campsite Check-in begins at 2:00 PM and checkout should be done by 10:00 AM. You may set up earlier if the site was not occupied the night before. If you are unable to leave by 10 am, contact the camp office at Tesomas.